As Australians become more and more health-conscious, sparkling water drinks are also becoming more popular as low carb, low calorie, and low sugar alternatives to unhealthy drinks like sodas. They even replace ‘normal’ water in some cases. Doctors recommend we drink 2 litres of water a day for optimal health, and when the taste of plain old water becomes boring, many people switch to sparkling water, in some cases flavoured ones. But “health” fads aren’t always great for your health or your smile. And some of us may have seen headlines touting the ‘acid’ in sparkling water as a threat to our teeth. At West Ryde Dental Clinic, we know! While it is true that carbonation can cause beverages to have higher acid levels, many studies indicate that carbonated water may only be slightly worse for your teeth than regular water and that they are certainly better for you than a host of alternatives. In this post, we’ll talk about the science of sparkling water, how safe it is, and some things some important thing to remember when choosing and drinking your carbonated water. So, what could possibly be dangerous about sparkling water? It boils down to this – theoretically; sparkling water can erode your tooth enamel. This is down to a chemical reaction – a byproduct of the carbonation process itself. 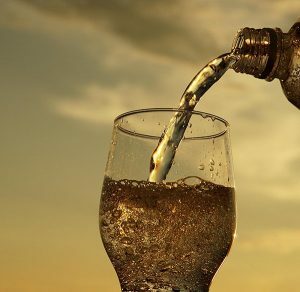 To turn regular water into a popular fizzy drink, low temperatures and high pressure are used to force carbon dioxide gas to dissolve into water. The result of this process is carbonic acid, which gives most sparkling water an acidity level lower on the pH scale than ordinary tap water. And if beverages get low enough (acidic) on the pH scale, they certainly can harm your teeth. A study led in the International Journal of Paediatric Dentistry by researcher Catriona Brown at the University of Birmingham, suggests that many flavoured sparkling waters have corrosive effects on teeth similar to those of orange juice (which has been proven to erode enamel). In the Birmingham tests, lemon, lime, and grapefruit were the most erosive flavours because they add citric acid to the water, which adds to the carbonic acid that is already present. Importantly, it is the added flavours that seem to be most dangerous. Another study in the Journal of Oral Rehabilitation, however, showed that plain mineral water and most flavourless sparkling water do very little to damage teeth. So what the science seems to add up to is that there is a slight chance that sparkling water can have an effect on your teeth, but even in the worst scenario, this damage will be equivalent to that of sugarless fruit juice. And in most of the studies, teeth were submerged in sparkling water for extremely unrealistic periods of time. Sparkling water presents a theoretical risk of tooth erosion, but the drinks would need to be consumed over an extended period and stay in the mouth for a very long time to have any substantial effect. But, on the small chance it might do some damage, West Ryde Dental Clinic has some suggestions to protect your teeth. Regular water is always the healthiest choice, but sparkling water is a better choice than sodas or juices. And there are a few things you can do to prevent even the risk of damage to your teeth. Drink unflavoured sparkling water. Flavoured sparkling water is usually supplemented with sugar, which by itself can damage your tooth enamel. Limes, lemons, and other citrus fruits have a high acidity level, which can increase the likelihood of enamel erosion, even without any influence by carbonic acid. Drink with a straw. Drinking sparkling water and other carbonated beverages (sugary beverages as well!) using a straw helps defend teeth by minimising the contact between dangerous elements in a drink and your tooth enamel. Take your drink with a meal. Don’t sip on sparkling water throughout the day, instead enjoy it during mealtimes. Chewing increases saliva production, which helps to neutralise and buffer the effect of acid on tooth enamel. Wash it down with water. Drinking regular water after drinking sparkling water (or any other problematic drink) helps rinse teeth and prevents erosion of the enamel. Brush only after 30-40 minutes. Brushing directly after drinking a carbonated beverage can make things worse. Just after drinking a carbonated drink, the enamel is slightly weakened. So wait to brush. Call (02) 9809 7000 or visit us at Shop 20 West Ryde Marketplace 14 Anthony Road in West Ryde. Dental Health Resolutions For Your 2018!